The City of Warrenville is responsible for residential solid waste removal. This service is contracted out for a period of five years, effective May 1, 2016; stickers will increase in cost every May 1st. The current refuse contractor is Waste Management, who can be contacted from 8 a.m. to 5 p.m. at (800) 796-9696. All refuse, yard waste, and recycling must be at the curb by 6 a.m. on the pickup date. Refuse, yard waste, or recycling put out late will not be picked up. Landscape waste collection runs from April 1 to November 30. If a holiday falls on a weekday and the regularly scheduled pickup is on or after the holiday, pickup will be delayed by one day. If a holiday falls on a weekend but is observed on a weekday, pickup will be delayed by one day. Friday pickups will be on Saturday. Collection services will not take place on January 1, Memorial Day, July 4, Labor Day, Thanksgiving Day, December 25. Christmas trees will be picked up the first two weeks following the holiday. Recycling needs to be contained in plastic recycling bins or containers 18 gallons in size or less, or cans that are 34 gallons in size or less labeled “recycle.” "Recycle" labels are available at City Hall for free. Recycling must weigh less than 50 pounds or be in recycling carts with wheels (toters). Recycling carts of 64 gallons can be rented from Waste Management for $3.00 per month; simply call (800) 796-9696. Cardboard boxes are not acceptable recycling containers. Weather and rodents can break down cardboard and spread debris along the street. Anyone using receptacles that do not meet the requirements will not be serviced. All recycling material must be clean; it cannot be contaminated with food items, trash, or yard waste. Contaminated items will not be picked up. Click here for the most common recycle contaminants. Plastic bags (garbage bags, shopping bags, zip-lock bags, bread bags, newspaper bags, etc.) and plastic film (shrink-wrap, plastic wrap around cases of water bottles, packing pillows, bubble wrap, flexible plastic food packaging, etc.) are excluded from the recycling program. Recycle all bottles, cans, paper and cardboard. Click here for an easy guide to find out if it is recyclable and tips for disposal. More information on recycling options can be found on the Environmental Advisory Commission's recycling page. Remember to make sure recycling is not contaminated. Residents are recycling, but not always correctly. Even with the best of intentions, sometimes items get placed in recycling bins erroneously. As a result, these materials end up in landfills, rather than being converted into reusable items. The wrong materials can also jam up the works at recycling facilities. Please take a moment to view this video that provides three simple recycling tips that can make a big difference today and every day. The Regional Household Hazardous Waste Facility in Naperville is located at 156 Fort Hill Drive next to the Public Works Service Center and is open from 9:00 a.m. to 2:00 p.m. on Saturdays and Sundays excluding holidays. No material may be dropped off at any other time. Call the DuPage County Department of Economic Development and Planning, Regulatory Services at (630) 407-6700 or visit their web page for more information. 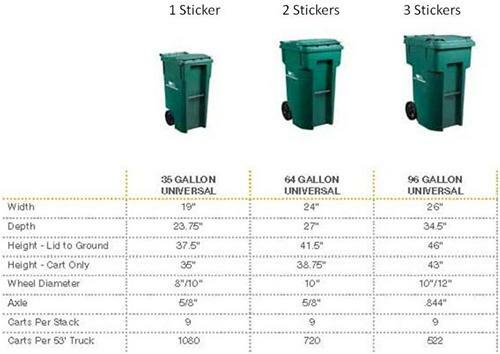 1Residents may put decals on their garbage cans for yard waste instead of buying yard waste bags. Decals can be obtained free at City Hall. 2 For bulk item pickup, call customer service at (800) 796-9696. Bulk items include furniture, mattresses, bicycles, carpeting, etc. 3For specialty item pickup, call customer service at (800) 796-9696. 4Refuse in a 35 gal. can 50 lbs will require one sticker, 36-64 gal. toter is 2 stickers and 65+ gal. toter is 3 stickers. Any container over 35 gal. must be a toter with a tipper bar. There are a few other collectors who will pick up large appliances. In the DuPage County Recycling Guide, there is a list of collectors and phone numbers. Complaints about service can be directed to Waste Management at (800) 796-9696. Unresolved complaints can be forwarded to City Hall at (630) 393-9427. By state law, residents are prohibited from disposing of electronic items such as computers, monitors, printers, televisions, fax machines, recorders, MP3 players, video consoles, DVD players, computer accessories, scanners, digital convert boxes, cable receivers, satellite receivers, DVRs, or small scale servers by placing them at the curb. Many local electronics retailers are now accepting these items, however fees may be applied. Throughout DuPage County, there are several free drop-off locations as part of DuPage County’s Electronics Recycling Program.